All cereal would be awesome if it didn’t have dried fruit in it, I reckon. Sultanas and raisins ruin everything! Yep, I’m one of those people. You know, the ones who think a mocha choc-chip Hot Cross Bun is perfectly acceptable to eat at Easter, the ones who berate the local cafe staff for not mentioning on the tag that the apple cinnamon muffins are full of sultanas, and the ones who will scrutinise their curried sausages for even a hint of dried fruit. Yep, I have a vendetta against these shrivelled foods. I’m the only one in my family to think this way though. Miss G will happily chomp on a piece of raisin toast and my CTO loves his mixed fruit in his cereal and his sultanas in his curried sausages. Since it’s hard to find a good cereal without dried fruit, I’ve been making my own for a few years. I actually started making CTO’s first when we were in Singapore when a box of cereal would only last 5 days, and at SGD$7-8 for a 450g box (AUD$6-7 at the time), it was a bit pricey! And then I finally find a factory made granola that I liked, and it was SGD$9 for 600g! Way way way too much money to splurge on cereal, and I’ve been mixing both of our cereals myself for a fraction of the cost ever since. 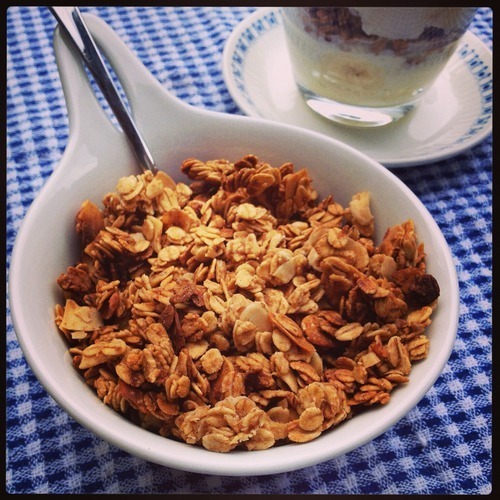 I made this granola last week as a change from my usual Maple Oat. I’ve had a lot of bananas hanging around in the fruit basket these past few weeks. One of my Facebook followers (and many cousins!) Ms N requested a banana bread recipe, and I’ve been searching for the perfect one but I’m not 100% happy with the results so far. Hopefully this cereal is a good substitute for the time being, as it really does taste like banana bread! You can really taste the banana and the cinnamon, and it’s got a great sweetness and crunch to it. 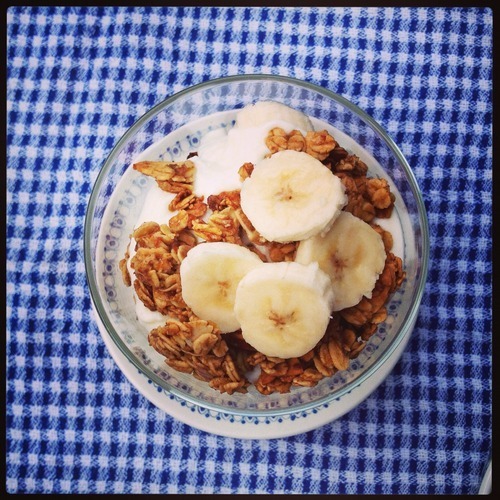 As you can see from the above picture, I love it in a good parfait with some coconut Greek yogurt and extra banana. 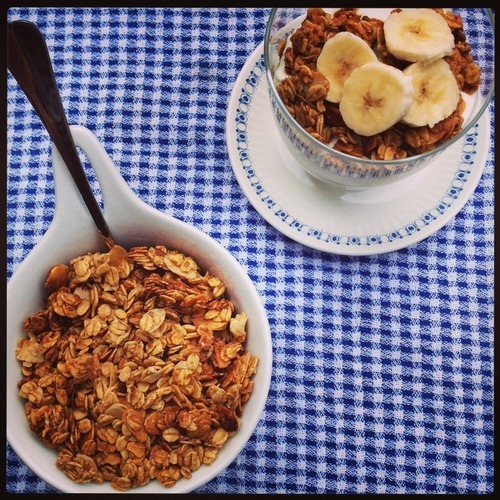 The original version of the Banana Bread Granola by Minimalist Baker had pecans and walnuts. I’d run out of both, so I used almonds, but feel free to use whatever nut you have on hand. You don’t have to use maple syrup or honey, you can you agave or even golden syrup if you like. Preheat oven to 150 degrees Celsius fan-forced, 160 degrees if not. Line 2 biscuit or sheet trays with baking paper. In a large bowl, mix together the first 5 ingredients (oats, nuts, sugar, cinnamon and flaxseed) until combined. Add the next 3 ingredients to a small saucepan over medium low heat (coconut oil, maple syrup/honey and vanilla), and stir until coconut oil has melted into the others. Remove from the heat and whisk in the mashed banana. Pour banana liquid over the oat mixture and stir until all the dry ingredients have been coated and are wet. Spread the wet granola over the 2 lined trays, then place in the oven. After 25-30 minutes, rotate trays and break up the granola into clumps. Bake for a further 25-30 minutes, then break the granola up again. Once cooked, leave to cool on trays for at least 30 minutes to let the granola harden. Notes: The only tricky part of this recipe is the cook time and temperature. The original recipe had the temperature higher and the cook time shorter, and I found that my granola was burning and still raw! If you’re worried about that happening to you, turn your oven down even lower and cook for longer. I’ve cooked other granola’s at 120 degrees for 1.5 hours before. Remember, you know your oven better than anyone!